What Will Santa Leave You? What Will Santa Leave You for Fitmas? Crowded malls, bumper-to-bumper traffic, the Wal-Mart madhouse, parties, gift exchanging, mistletoe, fruit cake, and all the traditional customs that go along with the holiday season. Have you given thought to what Santa will leave you this year? How about a sparkling diamond or a new car? Perhaps a fur coat or luxury home entertainment center. 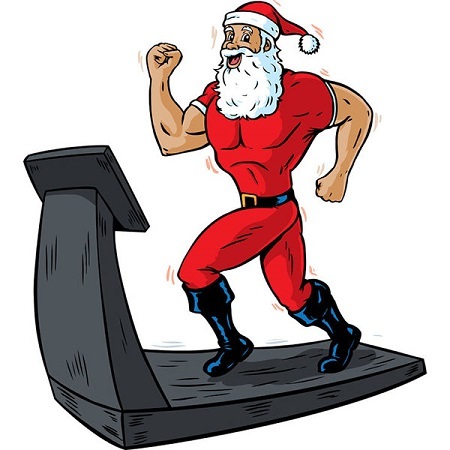 All of these are nice and extravagant gifts and sure to bring a smile to any recipients face, but what about the gift of fitness? This is something that you can not only give to yourself, but to your family and friends as well, and it is very affordable, without maxing out your credit cards. Gift Ideas for the New and Fit You! What’s great about this list is that you can also invest in these gift ideas for a friend or your spouse. Get involved in a fitness program together to help motivate each other. It really is the gift that keeps on giving. Exercise has numbers benefits, everything from increased energy to decreased risk of heart disease. It is the fountain of youth and will keep you healthy and make you feel better. Nothing fuels the mind and body like physical activity. It’s simplest, yet most constructive thing you can do for yourself. Giving yourself a little something to make exercise more fun is an added advantage. Now that I reminded you to not forget yourself, decide which item or items would best benefit you to make year 2005 the year of success. Here are a few holiday reminders to keep you on track. Play with the kids, grand kids, nieces, nephews, etc. Now that you realize it is okay to put yourself on Santa’s List and have some quick and handy tips to keep you on track, have a wonderful holiday and I will see you next year! If you are serious about losing that stubborn weight, you can learn more tips and tricks to boost your fat loss in my FREE Report; 15 Weight Loss Gotchas! No strings attached!